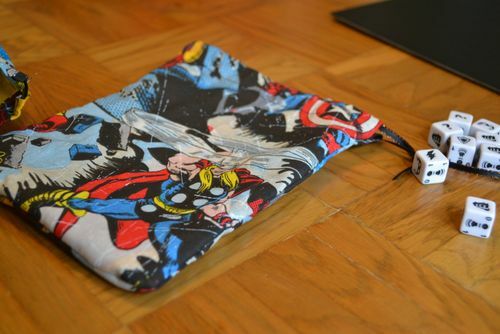 I have a friend who is very into crafts, design, and sewing. She's always been a little nerd-curious, but more and more recently, she's come out of the closet. 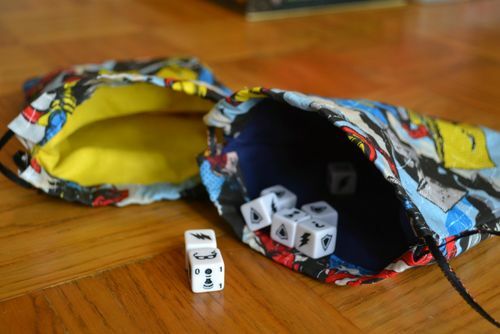 After lamenting about the terrible dice bags in MDM and teaching her how to play on a Friday night, I returned to her place the next afternoon on Saturday to find that she had already made me two new bags. They are large, lined, sturdy, and most importantly, not paper. The rim was made wide enough to reach your entire hand into, which is good for pulling out dice. I told her that she should make and sell the bags as part of her collection of merchandise. I told her I would advertise them here for her. 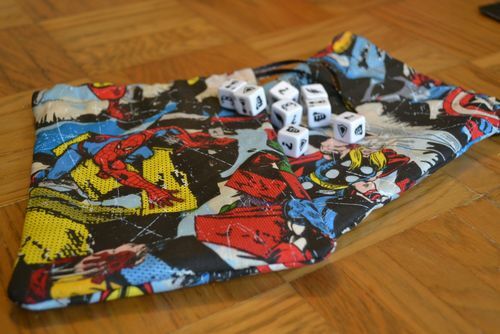 The ones she made for me and that are pictured are the "generic" Marvel fabric, but she can order custom Marvel character fabric as well, though you would need to contact her to find out what exactly she would have available. I don't have any stake in this, but let me know if this post violates any rules. Thanks! I advertised selling bags I made as part of an auction going on and it was taken down. Just FYI. Looking at the forum rules, it seemed as if self-promotion was not allowed and also no promotion to auctions, etc. going on on other parts of BGG. This is not my business and I'm not affiliated with it, so I do not know if that makes a difference. I have no problem taking it down if I need to. Thank you for the heads up though.